Preparation time: 15 minutes. Cooking time: 6–8 minutes. Cook tortellini according to package directions. Drain and rinse with cold water. Onto each skewer, using a twisting motion, push 1 cheese cube, 1 ham cube, 1 tortellini, and 1 tomato. Repeat, ending with tomato. 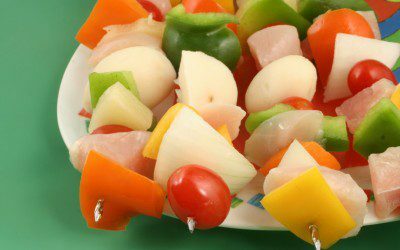 Place kabobs on a serving dish, drizzle evenly with Italian dressing, and serve. Alternately, the dressing can be served on the side for dipping. Exchanges per serving: 1 starch, 1 medium-fat meat. Carbohydrate choices: 1.